In order to be dubbed one of the greatest, a stamp needs to meet one or more of the following criteria: visually stunning; historically significant; interesting philatelic history; recognizable to those outside the hobby. We continue where we left off in the field of revenue stamped paper, the revenue stamp equivalent of postal stationery, to explore the denominations greater than two cents. We begin with a document that contain two common stamps imprinted, but which were imprinted on the same document. It is this combination of an orange two cent, type C (Scott RN-C1), which catalogs under $10, and an orange five cent, type P (Scott RN-P5), a used copy of which currently catalogs at $40, that makes this one of the greatest pieces of revenue stamped paper. The two designs feature two of the most revered American presidents, our fi rst president, George Washington, and the recently (at the time of the documents use) martyred Abraham Lincoln. The document is a combination of a receipt and a contract. Issued by a New York real estate auctioneer, the document fi rst acknowledges the receipt of a deposit of ten per cent of the purchase price of two lots on Rebecca Avenue in Pleasantville, New York. Secondly there is the inherent agreement or contract in the penultimate paragraph that this payment was made to fulfi ll the conditions announced at the sale, that is this deposit is to be paid to the seller at the time that the contract of sale is consummated. The documentary taxes enacted during the Civil War era are both comprehensive and relatively complex. Because this document is performing two functions which were subject to a tax, the document required two stamps. This auction fi rm for its own convenience had had the stamps imprinted on the document. Interestingly, by October 9, 1872, the time that this particular document was executed, both of these particular taxes were no longer in force. The two cent tax on receipts for the payment of money had been rescinded October 1, 1870 and the tax on agreements or contracts had been rescinded October 1, 1872. The second document presented here is also imprinted with a five cent stamp, but one of a different design featuring the image of our fourth president, James Madison. This design (type Q) is believed to have been introduced in early 1872 as part of a program to enlarge the designs of the revenue stamped paper (the larger two cent type C had been introduced in 1870; the 10 cent type S and 25¢ type U were also introduced in early 1872). One of the most common types of documents that was subject to a five cent tax was the general category of certifi cates. Part of what makes this document one of the greatest is that it was imprinted in brown, not the usual orange that was used for this design. 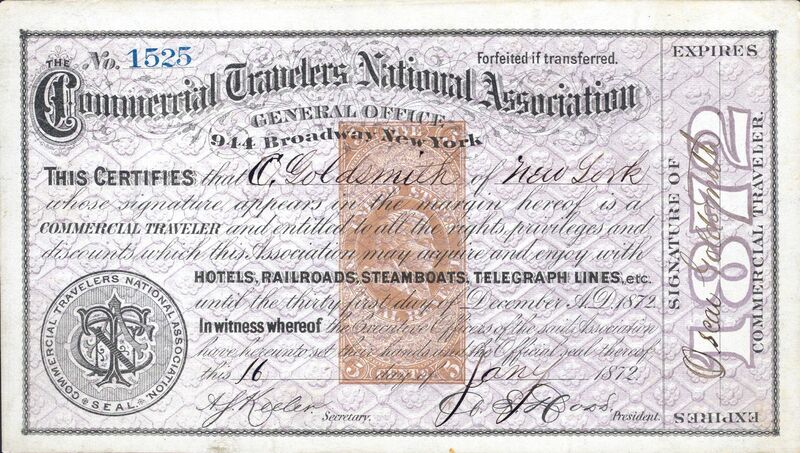 The Commercial Travelers National Association was formed to aid traveling salesmen. In 1872 the association published their Descriptive Handbook and Abstract of the Advantages, Privileges and Franchises of the Commercial Travelers National Association. Figure two shows a certifi cate of membership for the year 1872. Reading the text on the certificate one finds that membership entitled the named person to discounts on hotels, railroad and steamboat fares, and telegraph fees, and other things that the association may have been able to negotiate. This did for traveling salesmen of a bygone era what a number of associations, such as the American Association of Retired Persons (AARP) and the American Automobile Association (AAA) do for its members today. In 2003 at the time of the dispersal of the Buford collection of revenue stamped paper, only one example of the certificate with the brown type Q had been recorded. Since that time a second complete example has been recorded. In addition a cut square of the brown type Q is also known. As has been mentioned previously, 1872 saw the introduction of several enlarged designs of the revenue stamped paper. The 10¢ design type S was another of those enlarged designs that was introduced. Acquisition of an example of both type R and type S, the 10¢ designs, have always been the key to completing a basic type collection of the revenue stamped paper of the Civil War era. Only three examples of RN-S2 have been recorded on complete documents, two on Liverpool & London & Globe Insurance Co. policies and one on a policy of the Ohio Farmers Insurance Co. Because of the size of the insurance policies, collectors in the past have trimmed the stamp out of the large documents and a small number of RN-S2 in this cut square condition are also known. The past of our hobby of philately is replete with stories of similar vandalism (as seen from the enlightened present!). Another interesting feature of the RN-S2 is the instructive clause contained in the tablet just beneath the main rectangular design. 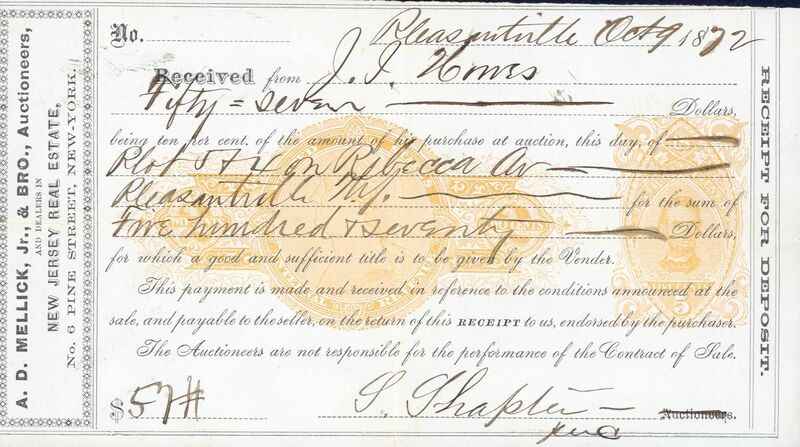 The clause reads “Good when the premium does not exceed $10.” Following the Commissioner of Internal Revenue’s directive of April 15, 1867 which required the review of documents before they could have revenue stamps imprinted on them, a series of instructive clauses were required on new orders for imprinting stamps of receipts, sight drafts, life insurance policies, and policies written for casualty insurance. 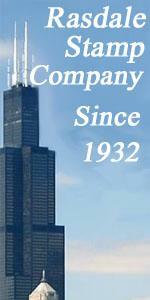 The tax rates on casualty insurance were based on the amount of the premium. When the premium was $10 or less the tax was 10¢. If the premium exceeded $10, but did not exceed $50, the tax was 25¢. When the premium exceeded $50, the tax was 50¢. Internal Revenue directed instructive or advisory clauses to accompany the 10¢ and 25¢ stamps on new orders for imprinting after April, 1867. 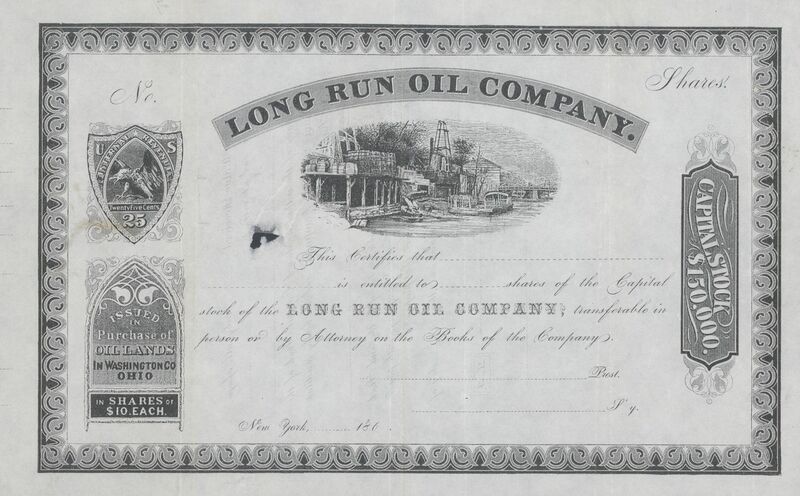 Our final example of greatest revenues among the revenue stamped paper in this installment is a stock certificate of the Long Run Oil Company of Washington County, Ohio, imprinted with a black, 25¢ type T stamp. Only one copy on a complete certificate has been recorded. Like all examples illustrated in this article, this certificate was once part of the collection of the late Bill Buford, who formed the greatest collection of revenue stamped paper. Like the other examples, this certificate also has an interesting story that lies behind it, a story that I do not believe has been previously written. Both the imprinted stamp and the underlying certificate are printed in black and almost certainly were printed simultaneously. How do we know that the American Phototype Company also printed the certificate? Take a close look at the ornaments that form the frame of the certificate. They match the frame of the certificate of the University Gold Mining Company, and the frame of an essay for Imported Cigars illustrated as C-100 in George Turner’s monumental volume, Essays and Proofs of United States Internal Revenue Stamps (1974, Bureau Issues Association). Many years ago, the late Ernest Wilkens noted the similarity of this same ornament to the ornamentation of other work of the American Phototype Company. This allows us to date the certifi - cate of the Long Run Oil Company to no later than January, 1866, after which the American Phototype Company relinquished the printing of documents in order to retain their government contract for imprinting revenue stamps. 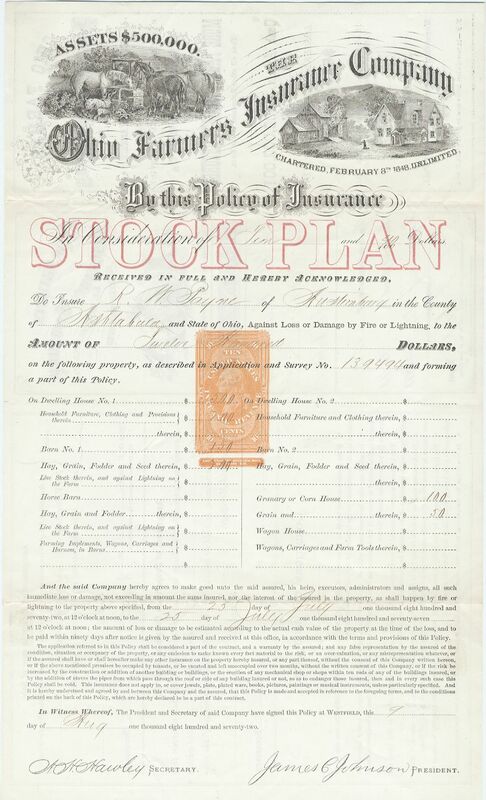 The stock certificate of the Long Run Oil Company thus becomes one of the earliest productions of the American Phototype Company, although probably not as early as the certifi cates of University Gold Mining Company, whose specimens are numbered 16 (the specimen checks for the University Gold Mining Company are numbered 15). In spite of my original intent to conclude this discussion of great items of the Civil War era revenue stamped paper in two segments, the size of the documents and the stories of what makes them interesting, have prevented me from doing so. But a third segment should suffice to conclude our presentation.